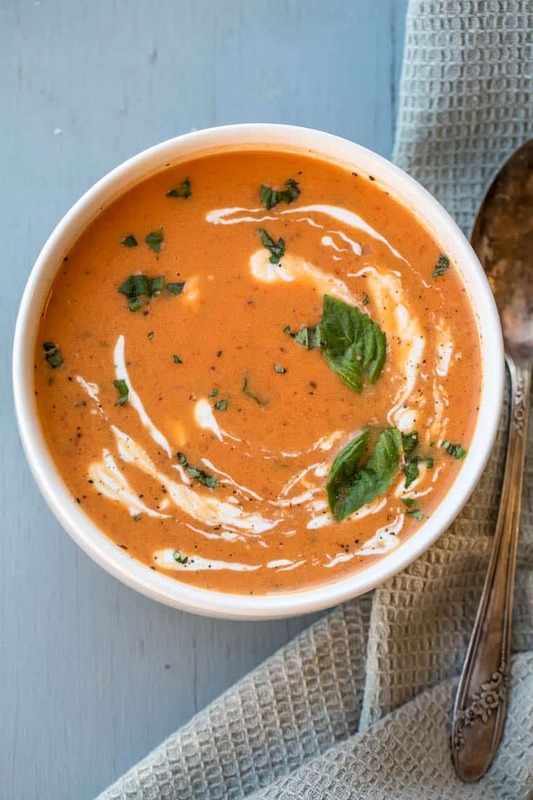 Homemade Creamy Tomato Soup Recipe – ready in just 30 minutes! 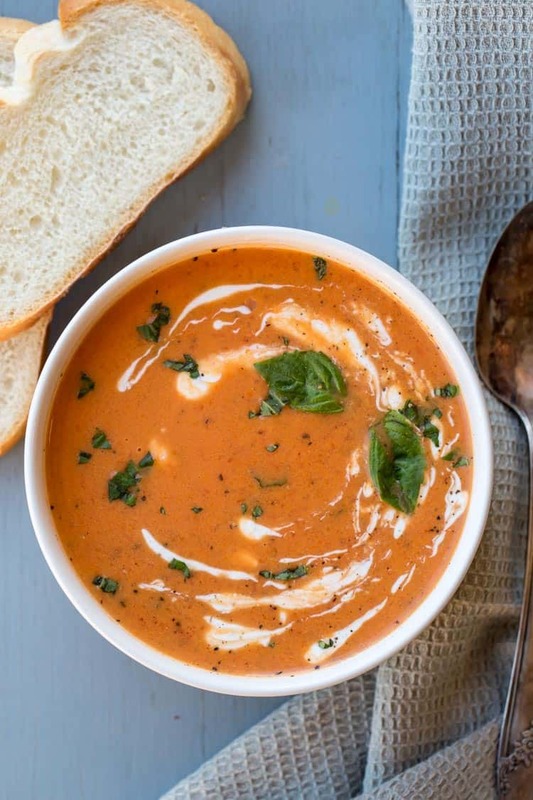 This easy tomato soup recipe is loaded with fresh tomatoes, carrots, onions, garlic and of course fresh basil. The vegetables are blended and added to a creamy broth for the ultimate comfort food. Serve tomato soup with our Turkey Bacon Grilled Cheese for a complete meal. Even if you have picky eaters, this tomato soup will become a family favorite! 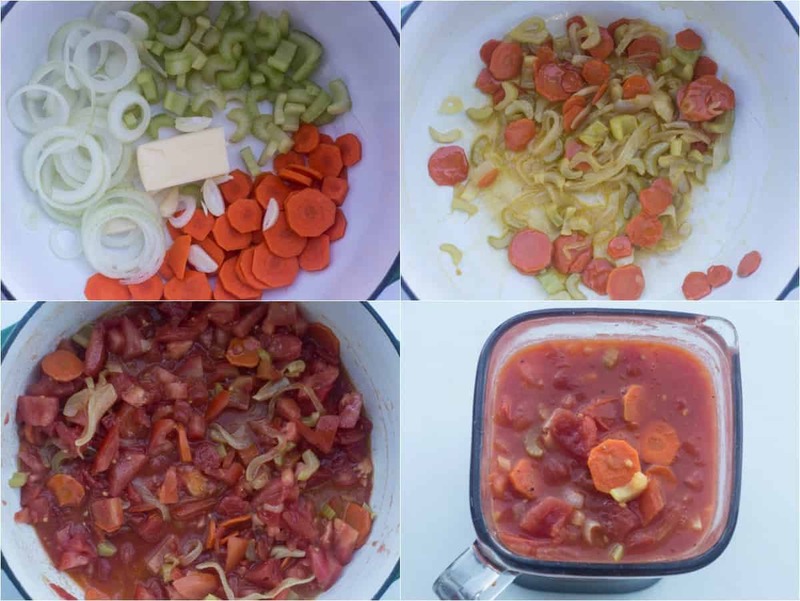 Our children strongly dislike tomatoes and are not huge fans of most vegetables but they absolutely love this recipe. The soup is full of so much flavor from the tomatoes to the extra vegetables and basil. The sauteed carrots, onions, celery and garlic are blended and add a surprising texture to the soup. The richness from the added vegetables gives it the taste of a tomato bisque soup. This tomato soup recipe cannot get any easier and simpler. With the soup completely done in under 30 minutes, it’s a keeper recipe. Saute the onions, carrots, celery and garlic until vegetables are tender. Add fresh and canned tomatoes to the vegetables and cook. Add the blended vegetables back to the Dutch oven. Add broth, cream and fresh basil. TOOLS used to make Tomato Basil Soup: blender and Dutch oven. Can I freeze Tomato Soup? Yes, tomato soup may be frozen. Add to a freezer container. Thaw and reheat to serve. 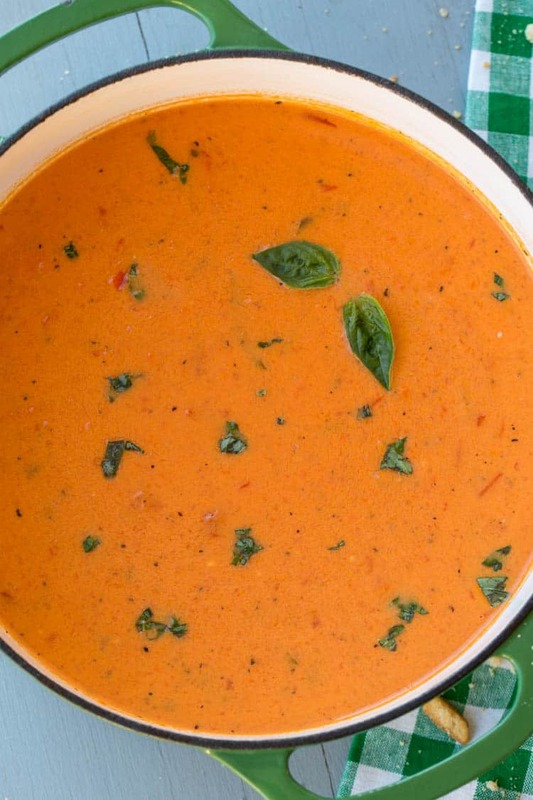 What to serve with Tomato Basil Soup? Tomato soup may be enjoyed with a classic grilled cheese, croutons, toast or crackers. Homemade Creamy Tomato Soup Recipe - ready in just 30 minutes! 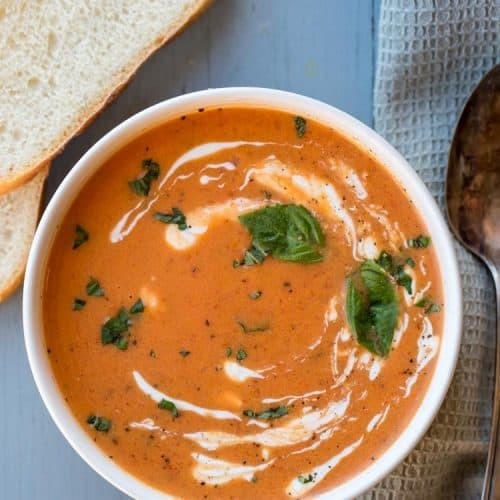 This easy tomato soup recipe is loaded with fresh tomatoes, carrots, onions, garlic and of course fresh basil. Comfort food! Slice onion, carrot, celery, and quarter garlic; add to Dutch oven with butter. Cook on medium heat for 10 minutes or until vegetables are tender, stirring frequently. Chop fresh tomatoes, add to Dutch oven. Add canned tomatoes with juices to Dutch oven. Season with the salt and pepper. Continue cooking 5 minutes, stirring frequently. In two batches, transfer tomato mixture to a blender, blend until pureed. Return blended tomato mixture to the Dutch oven. Add chicken broth, heavy whipping cream, fresh and dried basil. Add additional salt and pepper to taste, if desired. Bring soup to a soft boil, turn heat down to low, simmer another 5 minutes. I had this soup on a girls cabin retreat and I think about it ever since. It was so delicious and creamy and flavorful. By far my favorite tomatoe soup recipe!! Easy to make and so delicious recipe, my family enjoyed !!!! Thank you !!! I just made this tomato soup and I wish I found it sooner it’s SO DELICIOUS? and it is so simple to make! I just had to review it because it was just THAT good! Thank you for a wonderful recipe! I just made this for dinner !! It was such a hit 😀 and I can’t believe how fast it was to whip everything up. I also love that you add veggies and chicken broth; it makes it a healthier soup, which is much needed this time of year! 😀 thank you for sharing. Everyone really loved it! I served it with garlic and herb croutons.. and I also had cashew cheese on the side. We dipped pita crackers with it. Yummy ? I just wanted to point out that your directions say “parsley,” instead of basil! That’s awesome Angie!!! Kids love croutons with theirs as well. Love the pita crackers idea, we’ll try that next time, thank you☺.. So glad you thought it was a simple recipe. Love hearing that. Thank you for visiting..?? Nina, you are in for a wonderful treat. Wait till you see how easy it is to make – and the results… Mmmm?? Thanks for visiting with our family on our online Corner☺☺..